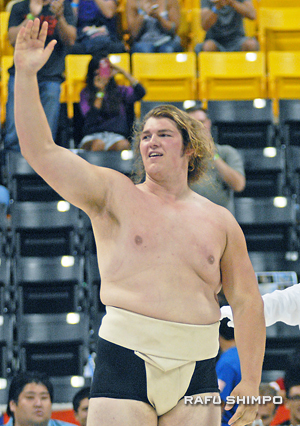 Despite no men’s gold medals, Americans turn in an improved showing at the 2014 U.S. Sumo Open. LONG BEACH.–There has been talk over the last few years about making a push — pun very much intended — for the inclusion of sumo in the Olympic Games. Once a far-off unlikelihood, the idea is gaining ground, due to the growing popularity of Japan’s national sport around the world. Any talk of the Olympics, however, will almost certainly need the involvement of the United States, and the participation of U.S. athletes in sumo will strengthen the argument considerably. Above, 440-pound Kelly Gneiting surrounds 187-pound fellow American Llende Rivera in the openweight rounds. At Sept. 20’s U.S. Sumo Open at the Pyramid at Cal State Long Beach, there were more than a few hints that the level of sumo on these shores is beginning to come of age. While Mongolian wrestlers dominated the men’s divisions, the Americans managed to walk away with five medals. On the women’s side, most of the combatants were from the U.S., showing the growth of sumo among female athletes. “What this means is that the winds of change are blowing,” said 440-pound Kelly Gneiting, who competes from Arizona. Andrew Freund, the director of the U.S. Sumo Open and the president of the U.S. Sumo Federation, said the showing by domestic competitors was good, although they have a long way to go to be true contenders on a world stage. The strong evidence of sumo’s development may have come from a North American, Canada’s Brodi Henderson, who electrified the sizeable crowd by winning the gold medal in the men’s openweight division. Henderson’s path to the title had to go through a four-time world champion and former professional rikishi in Japan, Byambajav Ulambayar of Mongolia. Despite weighing in at 45 pounds lighter, the 6-foot-7 Henderson has a six-inch height advantage and was able to raise Ulambayar’s center of gravity and force him out of the ring in the openweight semifinals. At the medals ceremony, Henderson gave plenty of credit to Ulambayar, who has served as a trainer to the Canadian. Canada’s Brodi Henderson waves to cheers after winning the openweight division gold medal. He said his approach was to focus on staying upright and hope for the best. The guest of honor was former Japanese competitor Yamamotoyama, who is said by some to have the highest recorded weight for any person in his homeland. Once tipping the scales at more than 600 pounds, he has said that sumo is usually not about size, and that the training makes all the difference. The women were led by an upstart middleweight from New Zealand, 23-year-old Geneva Webber, who finished the day with no losses and a pair of gold medals around her neck. Saturday was her first-ever trip to the U.S. Open, a fact she said may have helped her chances. 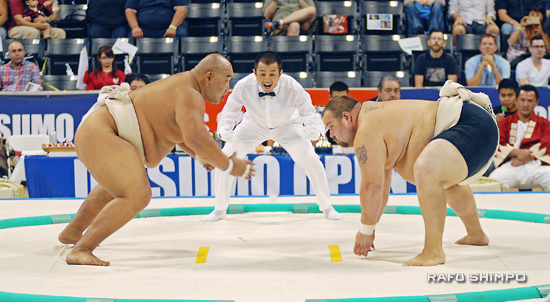 This was the 14th U.S. Sumo Open, and for the first time, it was taped for TV. The tournament will be broadcast Oct. 14 on the Universal Sports Network. Later re-broadcast dates have yet to be announced. Freund is hoping the popularity of the sport grows to a point where this is just one of many sumo events. “If there’s a good reaction from the TV audience, it may help establish a wider fan base and more sponsorships,” he said. New Zealand’s Geneva Webber, left, tussles with Tiffany Tran of the USA. Webber finished the day undefeated.